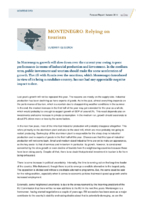 In Montenegro, growth will slow down over the current year owing to poor performance in terms of industrial production and investment. In the medium term, public investment and tourism should make for some acceleration of growth. The rift with Russia over the sanctions, which Montenegro introduced in view of its being a candidate country, has not had any appreciable negative impact to date.